The 1935 Hurricane was a disaster of incredible magnitude. It had sustained winds of 185 mph and a storm surge of 18' to 20'. To this day it's referred to as the Great Hurricane. It's surreal that so many natural disasters occur at night, and this Florida hurricane was no exception. It's impossible to try and imagine the extent of terror one feels when a storm rips and tears at everything around you. The rain, the wind, and the darkness pummeling and shrouding you. Debris flying, filthy water surging around and over you. Buildings being torn apart. The desperate screams of people and animals fighting to stay alive. You can't see, because all of this is happening in the dark around you. When you add in the fact that this was primarily an unexpected Florida Keys event, it serves to heighten the scope of fear and damage. After all, this was a popular holiday weekend. Visitors had come down for a Florida Keys vacation, expecting to enjoy the beautiful Florida Keys weather, the beaches, and spend a fun weekend with family and friends. No one expected that tragedy would strike. Not even the experts. When the experts did notice the 1935 hurricane, their original belief was that it would hit further south, affecting Cuba. It's true course wasn't determined until it was too late to properly coordinate evacuations. Monday, September 2, 1935, this small, but very intense Category 5 storm landed about 8:00 p.m. The Islamorada FL area sustained winds of 200 mph obliterating most everything in it's path. 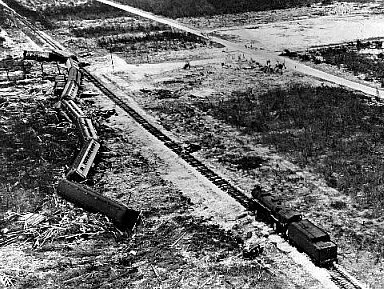 The remainder of the Upper Florida Keys suffered severe damage and the Lower Keys sustained damage to parts of the Flagler railroad. Another factor adding to the 1935 hurricane death toll, was that the government had numerous work camps in the area. Unemployed World War I veterans were housed here, and were involved in various construction detail projects arranged by the government. As soon as it was determined that the area was going to take a direct hit, help was sent to evacuate the veterans and other employees. However, the plan was executed too late to be effective. The train sent to bring them to safety, reached the area about the same time as the 1935 hurricane made landfall. Except for the engine, all of the train's 10 cars were forced off the tracks and flipped when the surge hit. Some of the people on board were killed outright when the train overturned. Others were killed by the devastating storm surge. 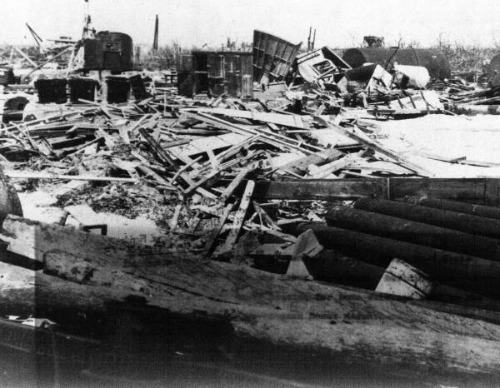 The brute force of the Florida hurricane was so strong that it proved to be the kiss of death for the Flagler Overseas Railroad. The Overseas Railway he'd successively completed just 23 years earlier was so severely damaged, repair was no longer a viable option. Flagler's Folly ceased it's operations in the Florida Keys forever. With so many visitors, residents and veterans in the area, the Labor Day hurricane couldn't have had worse timing. A nightfall landing complicated the matter substantially. Many people were swept out to sea. Others, like a group of veterans, drowned screaming for help when the pit they'd taken refuge in filled with water. Small children and parents, struggled to survive by clinging to anything they could find. Bits and pieces of floating debris, boards, and mattresses were used as life preservers. However not everyone survived. Smashing debris caused many injuries and deaths. People lost their grip and fell victim to the pounding waves sweeping the area. 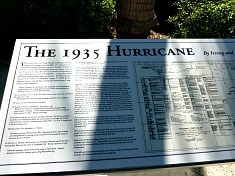 In the end, over 400 people lost their lives in the 1935 hurricane. This sad total of deaths needs to be put into proper perspective with another, similar disaster. This event is considered to be the worst in the history of the United States. Occurring close to the same date, but years earlier, was the September 8, 1900 hurricane that decimated Galveston, Texas. There are different, controversial numbers of reported deaths ranging from 6,000 to 8,000 with some reporting the total at 12,000. At the time, Galveston was home to about 37,000 people. No matter which death toll you accept, the city was stripped of a large percentage of it's population. Now put that into perspective with the Great Hurricane of Labor Day, 1935. Approximately 1000 people lived in the area because the Florida Keys had yet to become a major destination point. The reason for this was that egress out of the Florida Keys was limited to the railroad, boat, or ferry. When the Labor Day hurricane finally swept through and the body count was finished, over 400 people had lost their lives. This was close to half the population of the area. 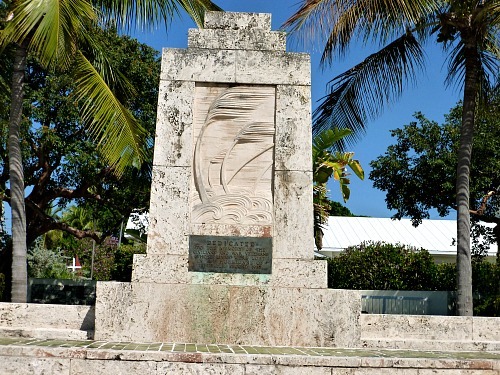 To commemorate this horrible event and the lives of those lost, a memorial was constructed in 1937 in Islamorada. It stands on the east side of US Highway 1, at Mile Marker 82. In front of the monument is a crypt, which holds the cremated remains of over 300 people who died during this horrible night. 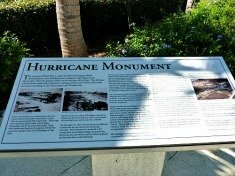 The 1935 hurricane serves as a sad but constant reminder of mother nature's power. If today's warning systems had been implemented in advance of that day, the loss of life would have been substantially reduced. The monument speaks silently to us about the horror everyone endured. It also reminds us that we need to take heed when a warning is sounded and act immediately.